Peach season has returned to Tucson and that makes me happy. Growing up in the Northeast United States, we really didn't get good peaches unless we ordered them shipped from Georgia. Otherwise, the store-bought ones went from hard-as-rock to flavorless mealy-and-mushy overnight, without even a minute in between when they were perfect. The peaches we get in this region are excellent, although sometimes they are smaller varieties. And I love how long our peach season is. Because of the numerous microclimates we have across southern Arizona, our peach season begins in mid-May and lasts into the middle or end of July! That's a peach of a season, isn't it? I have been going back to look on blogs of friends who live south of the equator to find peach recipes they posted while we could only dream of last summer’s peaches. Paula had Peaches in Vanilla Bean Syrup on Vintage Kitchen Notes in April, and Anna from The Littlest Anchovy posted Char-Grilled Peaches with Mascarpone, Honey and Hazelnuts. Salan Masala Baked Peaches were presented by John of He Needs Food. Those recipes should get me started in my quest to eat a heck of a lot of peaches in the next couple of months. Any ideas from you all? One of our all-time favorites is the unbelievably simple and rustic peaches in red wine. We learned of this in Italy. You simple slice up peaches into your wine glass that still has some red wine in it. (Really? You had unfinished wine?) It is delicious and light after a large meal. For this week, I decided to try something that has been on my mind for a while. My mother's cinnamon cherry cobbler has a great topping of pecan-cinnamon swirl biscuits. To date, I have only made them to top her (until now) sacrosanct cherry cobbler (From Mom's Kitchen). But I have often thought they might be great on any cobbler! My resident polymath tells me that cobble means “lump,” which means that paving stones, coal, small hills, incompetent repairmen (never ever use the term for a shoemaker! ), and this category of deserts (topped with lumps of dough) all fall into the same category. 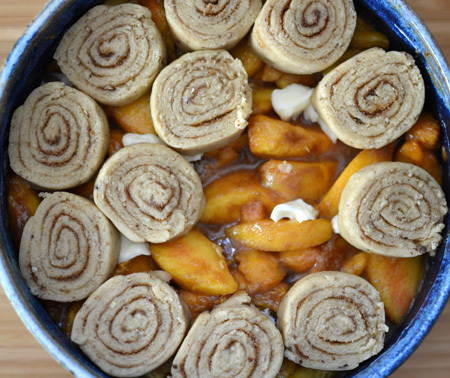 So, I made a peach cobbler with pecan-cinnamon swirl biscuits on top. I am so glad I did! The combination was perfect and now I feel free to try it with other fruits. Blueberries might be next! 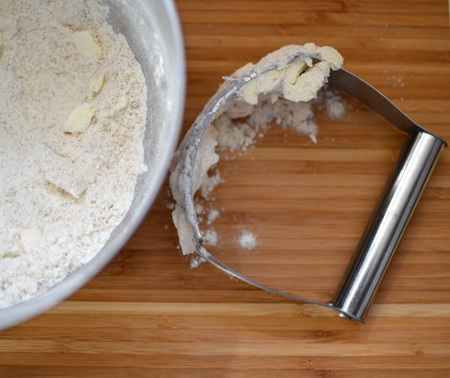 The recipe for the biscuits isn't one of those quick, slap-it-together-and-plop-it-on-top cobbler recipes. It does take a little fussing, but it is well worth it! This is a winning combination. 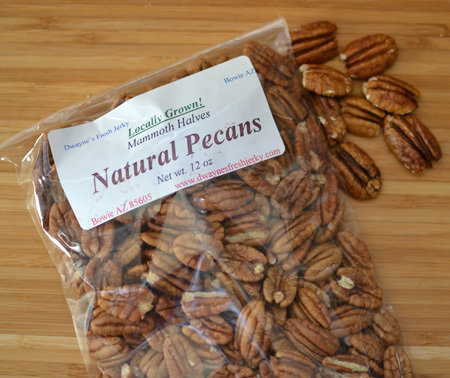 I used beautiful, plump Arizona pecans that I got form Dwayne's Fresh Jerky in Bowie. Oh, wait! Pears! ... Maybe the next one I make will be made with pears! 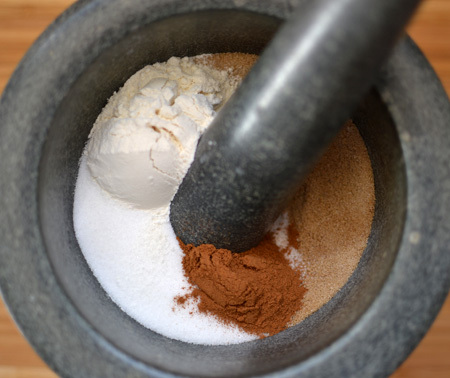 Sift flour with baking powder and salt into a mixing bowl. Add 3 tablespoons brown sugar and pecans. Cut in the butter until particles are fine. Combine egg and milk. 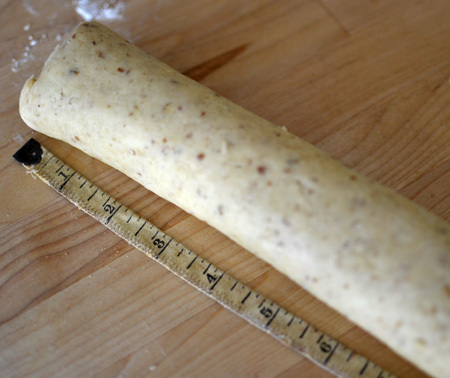 Add to flour mixture, mixing until all dry particles are moistened, adding a few more drops of milk if necessary to make a rollable dough. Mix sugar and lemon juice well. 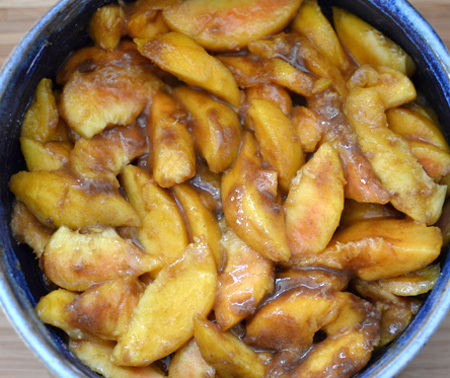 Remove cobbler from oven and glaze while still warm. 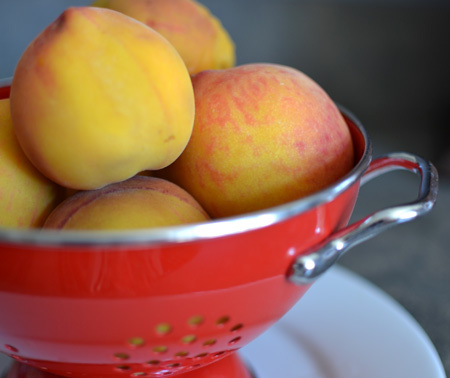 • The easiest way to peel peaches is to drop them in boiling water for 30-45 seconds, then drain. The skins will slip right off. OMG, that looks heavenly. Seriously, my mouth is watering. Kudos to your ideas, but also to your photography and conversational commentary that brings it all alive. I have seen the name of your blog in quite a few other fabulous places (comments and blogs), so, I finally got around to coming by for a visit and what a lovely blog this is - I have looked at a number of your posts and they are wonderful, pictures and recipes. 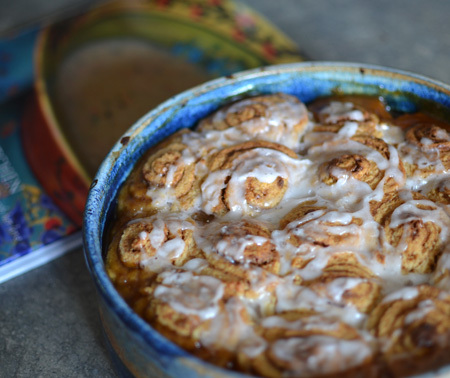 And as far as this post is concerned, I must admit I have never heard about a peach cobbler with pecan-cinnamon swirl biscuits before but your recipe looks simply amazing with those sweet peaches and pretty swirls that I feel like I should try this as soon as possible! I am looking forward to my visits in the near future - glad I took the time to take a look and be amazed! David, I'm curious. Did your mom ever make the biscuits to be eaten by themselves? I think cherries and peaches are my top two favorite fruits, and the season is always short, no matter how long. 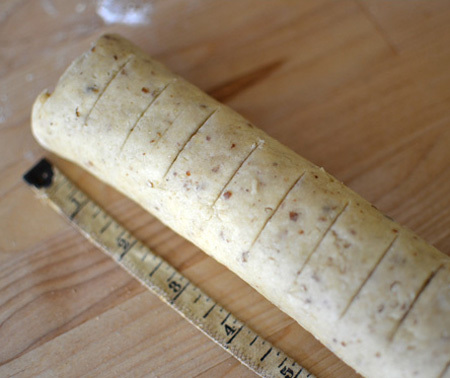 I´ve yet to try this idea of cobbler rolls, is so ingenious! I might try a winter version of it.Though I have blackberries and cherries frozen for winter emergencies... Red wine with peaches, I don´t know why we only use red with certain ingredients, it goes with everything. This is a fabulous dessert! Andrea - welcome to Cocoa & Lavender! Glad you came by for a visit! I will be heading over to the Kitchen Lioness (great name!) soon to see what you are up to! Missy - no, I have never tried the biscuits baked by themselves - what a great idea! My first thought is that it might be good to bake them in a cake pan similar to the cobbler so that they don't all come undone... If you try it first, let me know! Paula - I seriously debated adding cherries (and blueberries) to this cobbler as that is one of my favorite food combinations. Glad you like this - and the peaches in red wine. Such a lovely way to end a meal al aperto. Oh, and when my mother made the cherry cobbler for my father's birthday (in February), she had to use canned, unsweetened cherries! This looks like a wonderful summer cooking project. I love recipes like this -- many different elements, all put together to create one gorgeous and delicious result. Beautiful images, and I love the ceramic dish -- makes it look even more comforting and delectable. Valentina - I think you will like this recipe just from lookin at other recipes you love! Today I am making another peach dessert - this time a peach and cherry cake! David, this is so beautiful. Especially that last photo. What a lovely, and tasty, combination. I miss the stone fruit season so much! And thanks for the mention! John - I think one of the nicest things about blogging friends in both the northern and southern hemispheres is that it keeps us looking forward to our upcoming seasons. Am patiently (really?) 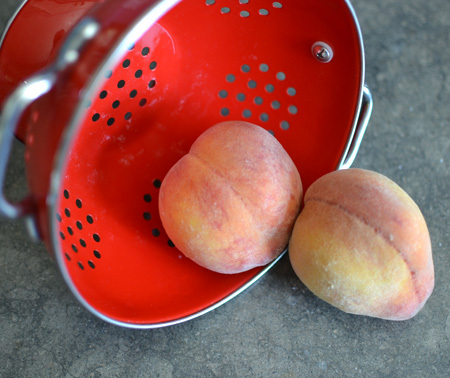 waiting for the the freestone peaches to be ripe - then I can make your salan masala baked peaches! Ah, David, what is there left to say? Your other comments reflect all my thoughts too! 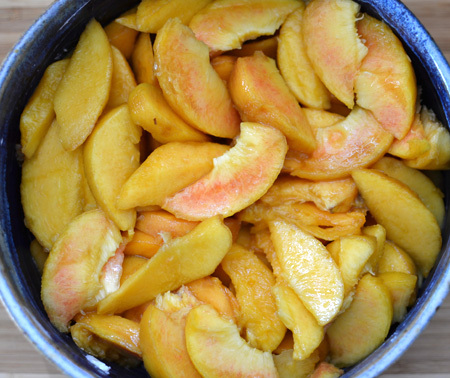 I completely understand the disappointment of hard-to-mushy peaches (and therefore mail order them) and I, too, have a collection of peach recipes (because good peaches are one of my very favorite fruits!) This recipe will definitely go to the top of my collection! On a different subject, I made your Sonora Coffee Cake today--I had to modify it with using only half of the suggested amount of yogurt, replacing a half cup of white flour with whole wheat, blueberry preserves rather than the cactus ones, and I threw in some blue berries. It probably wasn't as Sonoran as yours but it was terrific and my three guests loved it!!! Thank you, Susan! 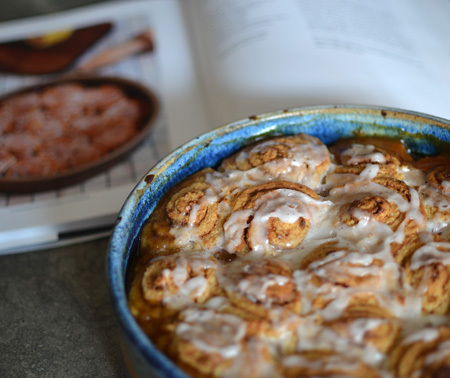 I am overdosing on peaches these days - such are my problems... :) Glad you made the Sonoran Coffee Cake - I imagine the wheat flour combined with the mesquite flour was wonderful - and the fruit choices, too! Wish I were there for a piece! Wow! 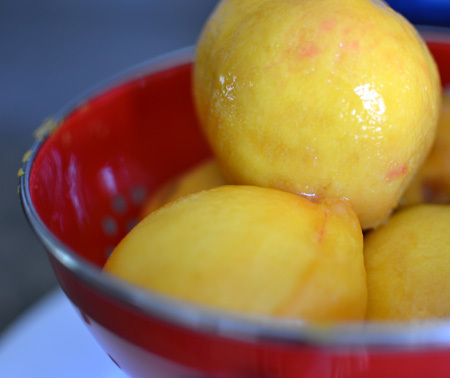 I adore peaches & am going to have to try this recipe! You're fortunate to have such lovely peaches for so long. Yes, Susan, we are lucky! But then you have those beautiful king crabs... Everything is a trade off, isn't it? David - as per usual, this is a beautiful post! I love the way that you presented the cobbler (cobble, cobble! Haha, I love that!) with the cinnamon rounds on the top. So delicious, fresh and glorious with the beautiful fresh peaches and pecans. I'm definitely going to try this when peach season returns to us in Australia. For now, the only seasonal fruits are apples and oranges (sigh!). Thanks for this post. Love your work!! I was just over at Andrea's blog the Kitchen Lioness and I was intrigued by the name of your blog. Had to come over and have a look, I am so glad I did. Loved the post, the photo's and I am looking forward to following and trying out some of your recipes. 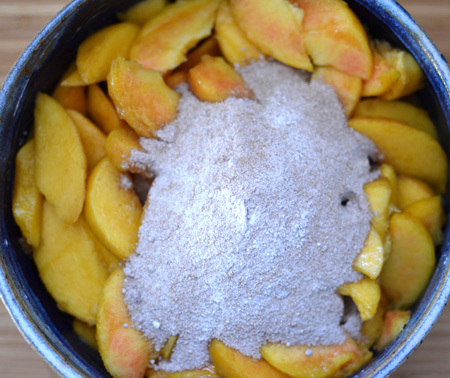 Your peach cobbler sounds and looks amazing. Karen. Laura - thank you so much! You are so kind! And I am glad my bad puns make you smile! You know, it might be worth trying this cobbler with apples and maybe some dried currants or cranberries - I imagine that would be fantastic! Karen - thanks for coming by C&L! I just perused Lemon Grove Cake Diaries and am truly humbled by your kind comments. Glad you liked the Peach Cobbler - hope you stop by again soon. Hi David, Thanks for checking out my blog and for the lovely comments. I am following now and will be back often to visit, I have to catch up on everything I have missed so far :) Have a great day! Karen - it is great making new blog friends - I keep learning so much about photography, cooking and design. Great fun. I am already enjoying following you, as well! I am crazy about peaches. I buy a big bunch w the intention to bake them into something, but they never make it that far. 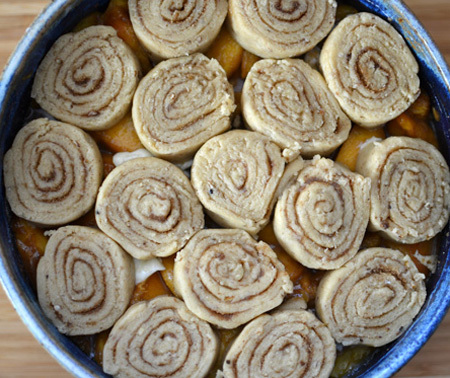 This cobbler is just what I've been looking for w that easy cinnamon-rolly top. Oooh... I cannot bare to wait until Summer when I can try this! I love peaches so much. Amazing - everything you make is something I want to eat..
Anna - I always feel so guilty when I post a summery dessert, knowing all the while that my friends Down Under are freezing... Your warm weather will be back before you know it!